What's up people, I'm Marky and I'm a 21 year old unemployed loser from the rough streets of Portsmouth in England. I've wasted over 150+ hours on H1Z1 in the last 2 weeks and I'm anticipating to hit 1000 within 2 months, all I need is my mountain of coke cans, crisps and the aroma of shame. I've got experience with raiding and screaming "China Number One" down the mic whilst doing so. I've gradually turned into Bear Grylls, mastering the arts of killing dsyncing wolves and drinking from dirty wells only to bandage the wounds it didn't leave for my health back. Hopefully I can pass down my knowledge of gorilla warfare to you all. Have a great day, toodlepip. So, I still frequently visit this page, whether I comment on threads or not. I see a lot of threads created talking about either, A) Let's revive BF3, or B) Who still plays on our servers? The last time I personally was involved in BF3 in ADK was when I was an admin, which has been awhile. 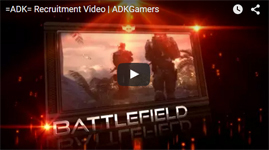 However, for those of you who really feel like you would like to continue to see the BF3 community in particular continue to grow and our servers continue to populate, #1: Apply to become a member of ADK. (APPLY HERE) I see a lot of registered users posting in this section. Which is fine, but if you already come on the website, the APPLY button is just one click away. And why not join this awesome community? #2: Recruit! I see a little of this being done in this section already, but look for like-minded people who love to play this game and squad up with them on our servers and hop on teamspeak. #3: Apply to become an admin! (APPLY HERE) Just like the fact that servers do not stay populated without dedicated members, servers do not stay player friendly without admins who are there to not only enforce the rules, but to more importantly make people feel welcome and want to stay loyal to the server because of the awesome job you do as an admin. I look forward to seeing some new applications soon. Whether they be member or admin applications. In this thread I am going to try my best to be as accurate and precise as possible to answer any questions that can possibly be answered as of this point. So, here we go..... If you have not seen the Star Wars Battlefront Reveal Trailer do so before reading any further. Now that you have watched the trailer, there are some things to note: The video was not actual gameplay. Not to say that the trailer did not look amazing, because it did, but it was more of a "Hey, this is a trailer for a 3d movie" rather than a "hey, this is a trailer for a video game". In-game footage and gameplay are two TOTALLY different things. However, despite it being a staged video, it was still pretty amazing. A little disappointed that we did not get gameplay, but there is speculation that gameplay will be revealed at this years E3 conference. BREAKDOWN OF TRAILER (From my POV): - Trailer starts off on the planet of Endor. In-game engine makes everything seem awesome - At 0:16 I get my "Oh god, battlefield re-skin" thought as this is the same voice of the BF4 soldier. - At 0:38 we see that the rebel alliance will not just be humans - Starting at 0:46 we see a rebel deploy a shield, followed by another rebel using a jetpack+rocket launcher combo to take out the AT-ST. - At 1:00 "PEW!PEW!" AT-AT comes along. Which to me is actually really stupid. How in the heck does a mammoth AT-AT navigate the dense woods of Endor? I don't know, I did not like that one bit. On top of that, the AT-AT looked almost to real, which made it look cheesy, in my opinion. - At 1:08 rebel uses radio to call in a bombing run by Y-wings. - At 1:37 we see our first confirmation that heroes and villains will be in the game as Darth Vader shows up. - At 1:40 we see the iconic Hoth battle. - At 1:42 we see a X-wing chasing a TIE fighter. - At 1:46 we see our second villain, Boba Fett on the planet of Tatooine. - And then at 1:52 and onwards we see a battle on the planet of Sullust, including the famous Millenium Falcon. All in all, a cool "cinematic/movie-ish trailer, would have still liked to see actual gameplay. Now onto some burning questions that some of you might have: 1) How many players can the game support? According to EA/DICE the max will be a 40 man battle 2) When is the release? The release is November 17th 3) What gaming platforms will be supported? PC, Xbox One, and PlayStation 4. 4) Will this game have DLC? Yes, it will. In fact, the first DLC will be FREE to all who buy the Battlefront game, pre-ordered or not. If you pre-order you get the DLC December first, all others will get the DLC one week later. The DLC is the Battle of Jakku which happens to be the setting of the opening scene of the new Star Wars: The Force Awakens Trailer and consists of two maps. 5) What are the benefits of pre-ordering? See for yourself, HERE 6) Will the game support both first and third person mode? Yes, yes, and yes. Thankfully. 7) Is this game going to be online only? No. Online multiplayer is an option. However, you can also solo or with a friend in co-op missions. 8) Will there be a campaign? No. Not exactly. There will be missions but not a campaign. 9) What game modes will be in the game? Not a lot is being revealed about the game modes as of this point. But based on what DICE dev's have been saying this is what will be included: - Walker Assault. - In atmosphere aerial combat 10) If I am on console, is there a splitscreen mode? Yes So, in conclusion I personally am having some doubts now about this. Only four maps to start off with when buying the game, DLC (which is always a pain), no space combat, no clone era, no gameplay still. After watching a video by JackFrags, a well known gamer on YouTube, he went into a little more detail about the game when he went to Sweden and watched some multiplayer gameplay. From his video, in short: - Player movement wasn't particularly fast. Average speed. - Ewok villages accessible for sniping positions, but no Ewoks, apparently. - Potentially no ammo in the game, just heat and cool down for the weapons. - Rocket Launcher is a pickup item. (Sounds like Hardline.....) - More pickups scattered around map. - UI clean and simple. Basic circular mini-map. If you shot or sprinted you appeared on mini-map. Four slot options for weapons and pickups. Most likely 3 primary, 1 for in-game pickups. - No 3D spotting. - Game running 60 FPS (Game Cover) Comment your thoughts below. It's almost here, and I'm so pumped! This is an official letter from the creators of the upcoming Star Wars Battlefront game! Read it HERE! The Type of Game A.I. FeatherSton3 posted a topic in Spam Topic, Forums Games, etc. .
No one will probably read this or think it's useful, but I have free time and I thought I would lend a hand to the new guys. (If you're a forum lover like me, then you obviously shouldn't have a problem with this.) So, I have heard from a few applicants/soon-to-be applicants that they are confused about 20 forum posts. For some reason some think it has to be 20 started posts (threads), some don't know how to post without spamming, and others are just confused in general, so I'm going to break this down. Post #1- Introduce Yourself! This is by far the most important first post you can create. It lets the community know who you are. In this post talk about what games you play, that way others who play the same game as you will respond and say, "hey man! I play *insert game here* as well! hop on Teamspeak and join us sometime!" If you're too uncomfortable with sharing some information, i.e. : age, location, etc. That's okay. (A few posts after number one can be responding to those who comment on your introduction thread.) Next Post- Member Application. Yes, I said member application. Unless you're a hacker, or a troll, there's no reason why we wouldn't want you to become apart of this amazing community. Alright, now you're up to about 5 posts or so. So now what? Well, I'm glad you asked. At the very top of the screen on the right hand side you will see Site Links. Under that tab you will see View New Content. This is by far the easiest way to help with your post number. Just make sure you don't spam. What I mean is, say something constructive. If it's less then four words, chances are it's probably spam. "What should I look for under View New Content?" The best thing would be to go to the forum section in which games that you play exist here on the forums. I.E. : Planetside 2, Battlefield 3, Battlefield 4, ArcheAge, DayZ. Last but not least, do not be afraid to start your own thread! Thanks for reading.